Black bears are common in the Columbia Valley. Large mammals are present throughout the Columbia Valley, although they tend to remain at higher elevations away from populated areas. 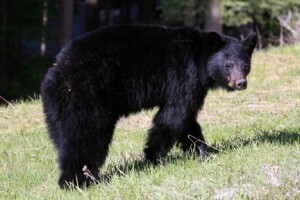 Species you are most likely to see are white-tailed deer, mule deer, and black bears. 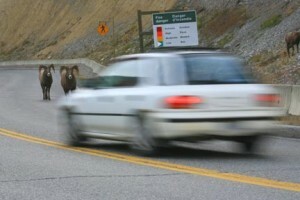 The exception are bighorn sheep, which are present in large numbers around Radium Hot Springs. They live in and around the town year-round, but are most obvious in November, when large males clash horns, often on the main street of town. Birdwatchers will be enthralled by the concentration of birds present in the Columbia River Wetlands between Radium Hot Springs and Golden. More than 100 species of birds live among the sedges, grasses, dogwoods, and black cottonwoods surrounding the convoluted banks of the Columbia. Of special interest are blue herons in large numbers and ospreys in one of the world’s highest concentrations. The wetland also lies along the Pacific Flyway, so particularly large numbers of ducks, Canada geese, and other migratory birds gather here in spring and autumn. On the south side of Cranbrook, Elizabeth Lake Bird Sanctuary is a large area of protected wetlands that is a haven for many species of waterfowl, including Canada geese, teal, and ringneck, scaup, redhead, bufflehead, goldeneye, and ruddy ducks. You can also see coots, grebes, black terns, and songbirds. Even if your not interested in photography, the Canadian Rockies Wildlife Photography eBook, by renowned wildlife photographer Wayne Lynch, is a great resource for searching out local wildlife. It includes a variety of Columbia Valley wildlife viewing recommendations. Around Radium Hot Springs, Bighorn sheep use the road as their own personal highway—so drive carefully.